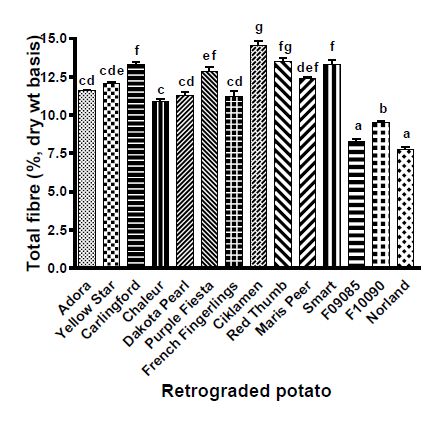 A research paper from July 2016 examined the fiber and starch profiles of numerous potato types. This is the first paper to fully describe the RS found in raw, cooked, and cooked and cooled potatoes. 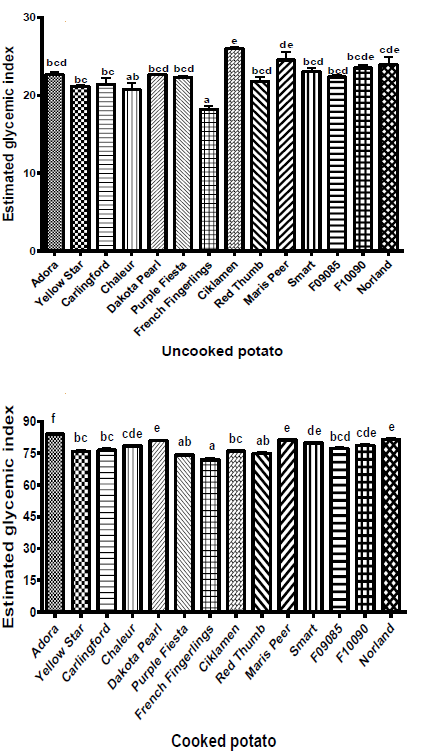 Published in the Food Chemistry journal, “Evaluation of nutritional profiles of starch and dry matter from early potato varieties and its estimated glycemic impact” (Pinhero et al, 2016), it’s still in draft, but I managed to sneak a few tidbits out for you. 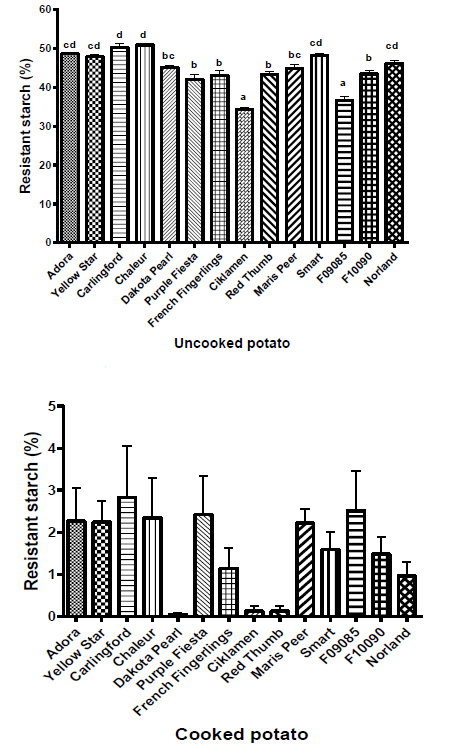 This study examined the starch and fiber content in 14 types of potatoes when raw, cooked, and cooked and cooled. The potatoes used were standard varieties commonly found in the supermarket. To make things easier, I added the type they are in parenthesis and ranked them. Here are some charts from the paper that you will find interesting. Note there is no category for “uncooked” potato under Total Dietary Fiber because an uncooked potato is almost 100% TDF in all cases. I find these charts absolutely fascinating, it’s the best compilation I’ve ever seen in one place. And what’s better, it confirms the RS contents that I found over the past couple years in diverse papers. 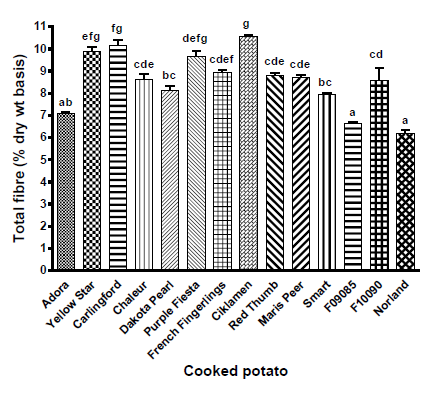 When making these charts, the researchers used the same potato for each test to eliminate errors. They took a raw potato of each variety and grated off some slices for testing “uncooked.” Then they boiled each potato for 10 minutes until tender and sliced off a couple more pieces. They immediately tested the hot potatoes as “cooked” and stored the cooled potatoes at 4 deg C (about 40F) for 48 hours for “retrograded”. I could not have designed a better test myself, this is perfect! 1. 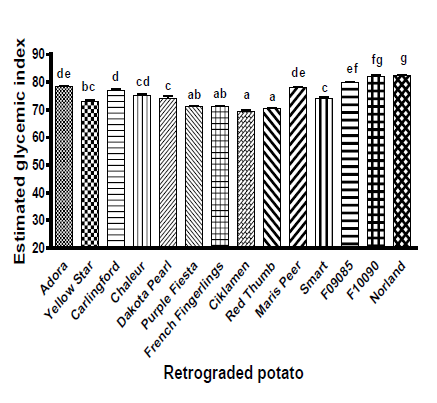 There are big variances between potatoes in each category. 2. 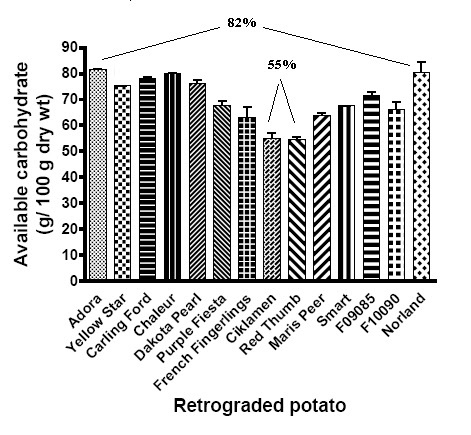 Raw potatoes have the most fiber and RS by a long ways. 3. 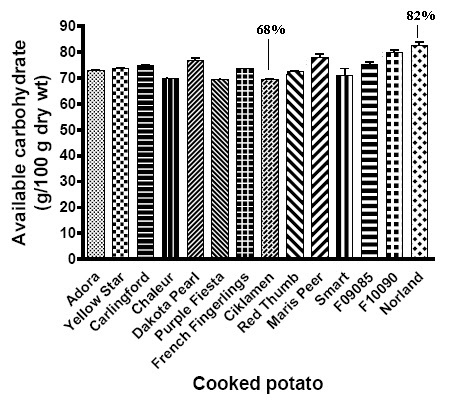 Cooked potatoes drop very low in terms of fiber and RS. 4. To get some fiber and RS back, cool your potatoes in the fridge, at least over night. 5. 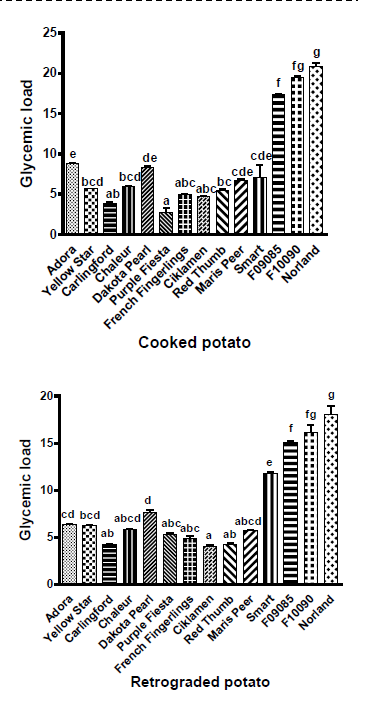 If you are concerned about Glycemic Index, cooling the potatoes lowers it 10-15%. Potatoes are GOOD FOOD. Don’t let anybody fool ya. But don’t let anybody talk you into thinking that French fries and potato chips are anything like real potatoes. When I talk about potatoes, I’m talking about boiled, roasted, baked, steamed, or fried in a pan with minimal oil. Not deep fried and soaked in artificial flavors and colors. For best results, eat a VARIETY of potato types. Don’t just get the familiar looking ones, get them all from time-to-time. It’s fun to experiment with different types. There does not appear to be a pattern, i.e. reds have more fiber. They all just seem to be different. 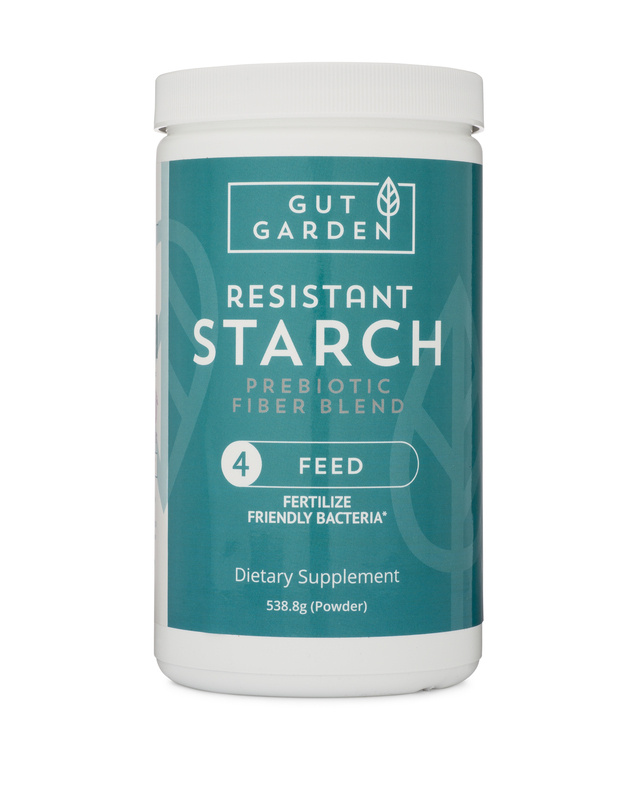 Keep in mind, though, they all have a great mixture of RS and fiber. No single potato could be called bad. The purple potato that measured very low in RS makes up for it in polyphenols and flavanoids from the purple pigments. 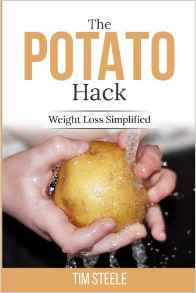 Don’t overlook raw potatoes. Don’t make them a meal, but when you are cutting up potatoes for dinner, have a slice or two raw. This will undoubtedly triple your fiber intake for the day. And also don’t overlook leftovers. In fact, make extra potatoes specifically for leftovers. 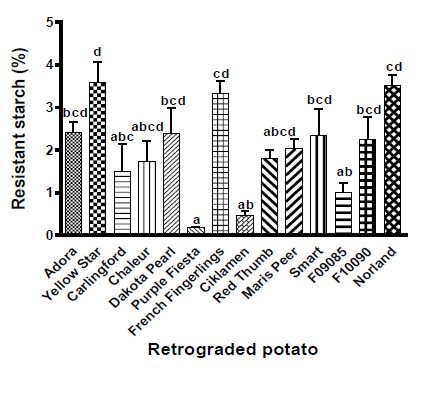 This study did not test another hypothesis that re-heated and re-cooled potatoes grow in RS with each cycle, but you do not have to eat the leftovers cold (though you certainly can). Heat them up in the microwave or a pan with a bit of oil. Pinhero, Reena Grittle, et al.